This bass excerpt from Haydn's Symphony No. 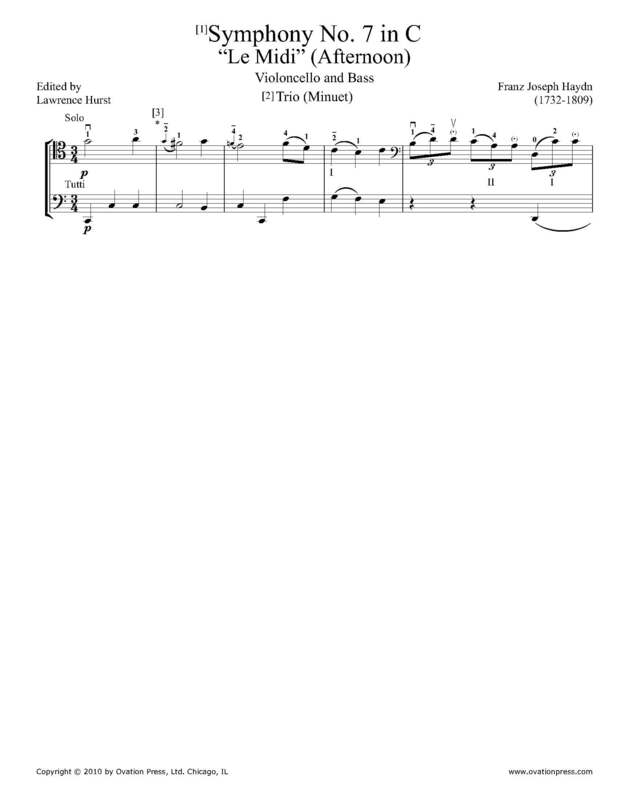 7 in C major, H.1/7 has been edited by Lawrence Hurst, former principal bassist with the Dallas Symphony Orchestra and Professor and chair of the String Department at Indiana University School of Music since 1986. Hurst's bowings, fingerings and other editorial markings have been added throughout the score. Haydn's seventh symphony is an early composition, written shortly after Haydn had joined the Esterházy court. It is the second of three that are characterised by unusual virtuoso writing across the orchestral ensemble. The symphony is popularly known as "Le midi" (Noon). Download and print the score today to gain access to expertly edited Haydn Symphony No. 7 bass fingerings and bowings from Lawrence Hurst! Please note: There is one page of music encompassing the bass solo in the Trio segment of the Minuet movement and one page of commentary and performance instruction. Haydn symphonies numbered 6-8 form a trilogy and carry the authentic titles “Morning”, “Afternoon”, and “Evening”. In the early standard Breitkopf printings, the solos in this score were given to the solo cello.